Submitted by Dan Dooré on Thursday, May 24, 2018 - 15:35. A project from Colin Piggot to fit the guts of a Sam Coupé into a new case, allowing as many peripherals as required to be fitted within the same case. 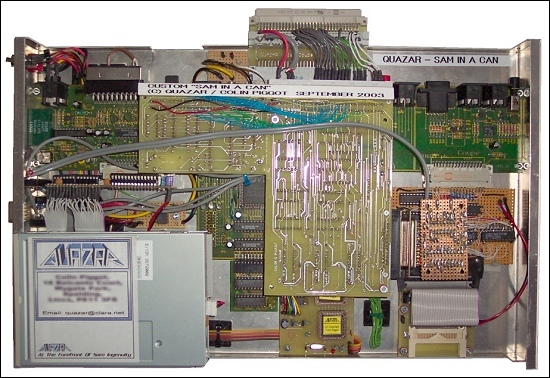 The most jam-packed Sam In A Can has consisted of: Sam Coupé motherboard, Disk Drive interface, Atom IDE interface, Compact Flash Interface, Quazar Surround soundcard, Quazar Surround Sampler Module, SID Interface and a PC Keyboard interface. The insides of the SIAC2 will have an original SAM motherboard with a long list of my own add-ons: a new 256K Memory upgrade, one of my disk drive systems, PC Keyboard interface, Serial mouse interface, Trinity Ethernet Interface (and boot ROM), SID Soundchip interface with 6581 SID and an updated Quazar Surround soundcard (news of which will be in the next issue of SAM Revival ). See the Quazar Site for details.